Capt. Thomas Kemble was a prominent ship's captain in the 1650s in Massachusetts, but that didn't stop him from getting into trouble for kissing. Kemble's life is well documented. As a merchant who settled in Charlestown, Mass., he imported metal goods and household necessities for resale to his warehouse. In return, he shipped lumber from mills he owned in Kittery, Maine, and the New Hampshire seacoast back to England. In addition to the more mundane aspects of his trade, he also was consigned a group of 272 Scottish prisoners of war. They were probably captured during the Battle of Worcester in September of 1651. During that fight, Oliver Cromwell's forces defeated the Scottish armies loyal to King Charles II. Kemble had the task of finding something for the prisoners to do. He most likely put some to work in his sawmills and sold others off as indentured servants. As indentured servants, the prisoners were not exactly slaves, as they could work their way to freedom. Few of the Scotsmen taken to the colonies, though, ever returned home after their unsuccessful defense of the king. Though prominent and prosperous, Kemble did not rise above the law. 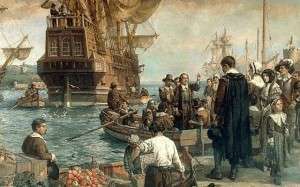 And the Massachusetts Puritans had plenty of laws to control social behavior. They punished adultery with death (though they rarely executed anyone). They banned gambling, fancy clothing, living with Indians and smoking in public. Missing Sunday services would land you in the stocks. Celebrating Christmas would cost you five shillings. In 1653, Thomas Kemble set sail on business, leaving New England for three years. Upon his return, his wife greeted him at the door to their home. And with that one act, he broke two Puritan laws. His kiss was adjudged 'lewd and unseemly behavior.' And, to make matters worse, it happened on Sunday, and so he failed to keep the Sabbath properly. Thomas Kemble spent two hours in the stocks for his crime. Later, Kemble's daughter, Sarah Kemble Knight, kept a travel diary of her journey alone, on horseback, from Boston to New York City in 1704. One of the most useful diaries of the period, historians still use it today. This story about Thomas Kemble was updated in 2019. Must have been quite the kiss. He loved his wife dearly. He missed her. So sweet. That’ll teach him! I wish I had some eggs to throw. 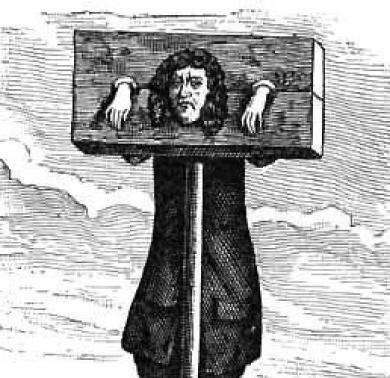 The illustration is of a man in the pillory, not the stocks. The story is often told, nut what is its source?